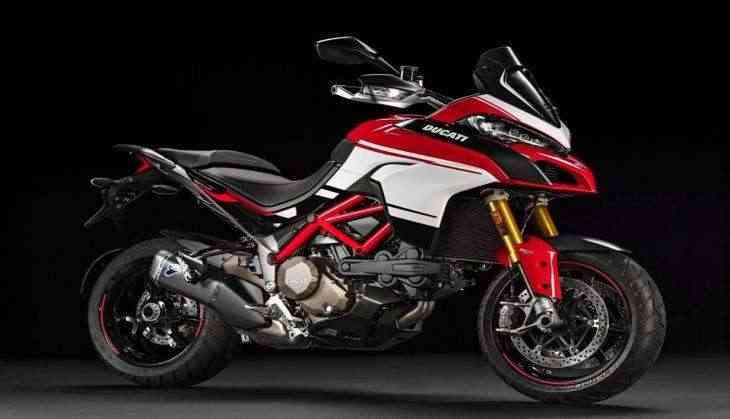 Italian superbike maker Ducati today launched Monster 797 and Multistrada 950 models in India, priced at Rs 7.77 lakh and Rs 12.6 lakh respectively (ex-showroom Delhi). The two models are among the five new models which the company plans to introduce in the country this year. "This is a major step towards the growth of Ducati product range in India," Ducati India Managing Director Ravi Avalur told reporters here. With the launch of these models, the company would now be well positioned to compete across price points, he added. "With these two models, we will rapidly increase our market share in the relevant segments of the Indian big bike market," Avalur said. Both these motorcycles are gateways to the Ducati world and its values, he said, adding with new model additions, Ducati now has a range of 19 products in the country. Powered by Euro IV compliant air cooled 803 cc engine, Monster 797 comes with various features like LED lights and LCD screen. On the other hand, Multistrada 950 is powered by a 937 cc powertrain which churns out a maximum of 113 HP. The tourer comes with four riding modes and Ducati safety pack that includes braking system, ABS and traction control. The deliveries of the bikes will begin next month. When asked about sales network expansion, Avalur said the company plans to open three more dealerships at Kolkata, Chennai and Hyderabad this year. Ducati already has six dealerships at Delhi, Mumbai, Cochin, Ahmedabad, Pune and Bangalore. On plans for local manufacturing in India, Avalur said: "We currently import bikes as CBUs mainly from Thailand. It is beneficial for us as India has free trade agreement with Thailand." The company is currently focusing on developing sales network in India, he added. Who is replacing Kapil Sharma on Comedy Nights?